When the Almighty put hoofs on the wind and a bridle on the lightning, He called it a horse. Enjoy a one, two, or three- hour guided ride under the fragrant forest canopy. 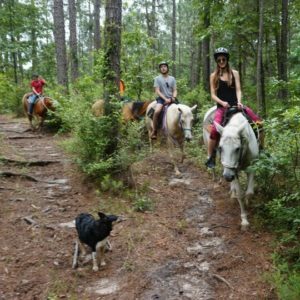 Choose relaxing, easy trails for beginners, or more adventurous trails for experienced riders. Each season presents a whole new experience - spring dogwood blooms, summer greenery, and fall colors, and there is no better way to view what God has made than from the back of a horse. His hooves pound the beat, your heart sings the song. Make a family memory of the "Best vacation ever!" We have just the right horses and ponies for all family members. Birthdays, Anniversaries, Honeymoons..Or just because you always wanted to ride! Gift certificates are available for a special birthday or holiday gift. One, two, and three hour rides available. Children 8 years to 14 years must demonstrate riding ability for Forest trails. 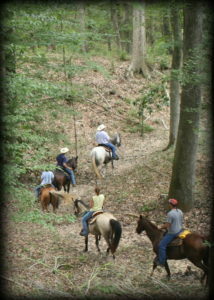 Ranch trails are available for younger riders and those with special needs. Children 16 and younger must wear approved helmet (provided). Call (337) 258-5782 to Book Your Ride!